يقع فندق Diplomat الأنيق ذو الـ 5 نجوم في Griffith، على بُعد 5 دقائق بالسيارة من Parliamentary Triangle في كانبرا، ويقدم غرف مزودة بخدمة الواي فاي المجانية ومواقف مجانية للسيارات. ويتمتع الضيوف بمسبح ومركز للياقة البدنية وساونا ومكتب استقبال يعمل على مدار 24 ساعة في اليوم. ويوجد بار في الموقع ومطعم. تتميز الغرف المجهزة تجهيزاً جيداً بتلفزيون ذكي إل سي دي مع قنوات فضائية وميني بار وحمام حديث مزود بمجفف للشعر. وتوفر بعض الغرف حمام أكبر حجماً مع حوض سبا لشخصين. يقع Diplomat Canberra على بُعد مسافة سير قصيرة من البارات والمطاعم في Manuka وKingston. يقدم المطعم ذو قائمة المأكولات الانتقائية مجموعة من الوجبات الخفيفة والإفطار والعشاء كل يوم. Please note that there is a 1.5% charge when you pay with a credit card. Please note that the total price of the reservation will be charged to the credit card used to make the booking, 24 hours prior to your arrival. Please note, there is currently renovation work being undertaken at the property from 08:00 until 16:30 Monday to Friday. This will be taking place until 22 February 2018. Modern refurbishment in a classical style. All facilities and staff first class. Pleasant 15 minute walk to vibrant Manuka Centre or Lakeshore. Spacious well-appointed atrium for relaxation, meals, meeting friends. All up an excellent and accessible base from which to enjoy all that the National Capital has to offer. First time I have stayed at the diplomat hotel but I am raving about it..the location is great..walk to Kingston hotel and manuka shops no problem..the staff are sensational especially the girls in reception, they both made sure I was taken care of with anything I needed...i will be back again and will stay here at the diplomat for sure!!! It is the second time I am staying at The Diplomat Hotel. I like it because it is always very quiet, the staff is very friendly, the restaurant of the hotel is very good - and I like to have my dinner over there. The rooms are quiet big, very clean and nice. There are many good cafes and places to have something to eat not far from the hotel in the centre of Manuka. Nothing is special about this hotel - but its nice and cheap. More than you need for few nights when you visit for work. Very clean,modern,comfortable,(especially the matttress), with a general "no trouble" response from staff. as regular travellers and fairly experienced in hotel accommodation we wish to hilight this hotel as one of, if not the best hotel we have stayed at. it was just easy in every way and particularly the staff who genuinely seemed to be hassle-free and enjoying the small challenges and opportunities to please. they were personable too and just enjoyable to be around. wanting some medication from my car it was no problem for the staff member (gail?) to go down to the carpark ton look. and her colleague brought us coffee! perhaps small things but noticed. i heard one other guest make some sort of complaint about the lifts but he seemed to just want to whinge a bit. the lifts were actually responsive and quick even with one out-of-order. everything else worked a treat! The room that offered us initially had a bad painting smell. obviously, the paint had not been dried yet. we were lucky that we offered to a better but smaller room after we complained. The staff was good and helped to move the bed to our new room. Very dated and in need of renovation. King bed was Queen size. Extra bed we had to pay for was so uncomfortable with springs sticking into al parts of the body that no one could sleep on it. Don't stay there. Room size is just OK not too large, but bathrooms are rather small, cleaners did not clean the room properly each day over our 3 day stay. The worst part of the stay was the air conditioning, it was noisy and located immediately above the bed, we couldn't run it at night it was that bad, sounded like a plane taking off every 5 minutes. I was very happy with my recent stay at The Diplomat. It is in an excellent location close to all Canberra's major attractions. The hotel had all the facilities we were after including WiFi! Our room was very clean, the beds were comfortable, and the shower was great. The decor is a little outdated however everything in the room was well maintained. All the staff I interacted with were friendly and helpful. The pool was a great hit with the kids, especially since we had quite a few hot days during our stay. I will definitely look at staying at The Diplomat again when we visit Canberra next time. We were in Canberra for one night traveling from Sydney back to the Mornington Peninsula where our family lives. This room was even better than I expected. We had an executive king room, and it was quite large and very clean. Towels were big, and there was plenty of hot water. There was also ample free parking underground with a lift just inside the door from the car park. As visitors from America, we wanted to see Parliament House and the Australian War Memorial, and the hotel was conveniently located for travel to those places. I would recommend The Diplomat Hotel to anyone traveling to Canberra. I travelled for work, but had my teenage daughter with me. Therefore the room with one queen and one single bed worked really well. We were happy with the staff, the service, and the restaurant and buffet breakfast was great. Would stay here again. Easy, underground parking too. After living in Kingston 35 years ago staying at the Diplomat was like coming home. A nice walk to Kingston and Manuka shops, parks, markets and the new development around the lake. The Diplomat successfully combines a classy level of service, professionalism and presentation with a welcoming and friendly stay. Thank goodness for the mini sewing kit as I popped a button on my slacks just prior to leaving. My daughter and I were late arriving due to our car breaking down - I rang and informed the hotel who told me not to worry they were there 24 hours and they would make sure that there was food for us when we arrived which was very much appreciated. i went with a friend and the staff were very obliging as we were two women who wanted our own beds but still paid a reasonable price. breakfast was also well priced. we have recommended this hotel to others and would stay there again. Last minute decision to book a hotel for my parents. Price was great. I live in Canberra so know the location is convenient. Stayed there the first night I moved to Canberra and had a good impression. Hotel is clean with all amenities you need. The extra single bed is handy. The hotel room is a good size as well. Great value for a lovely hotel. 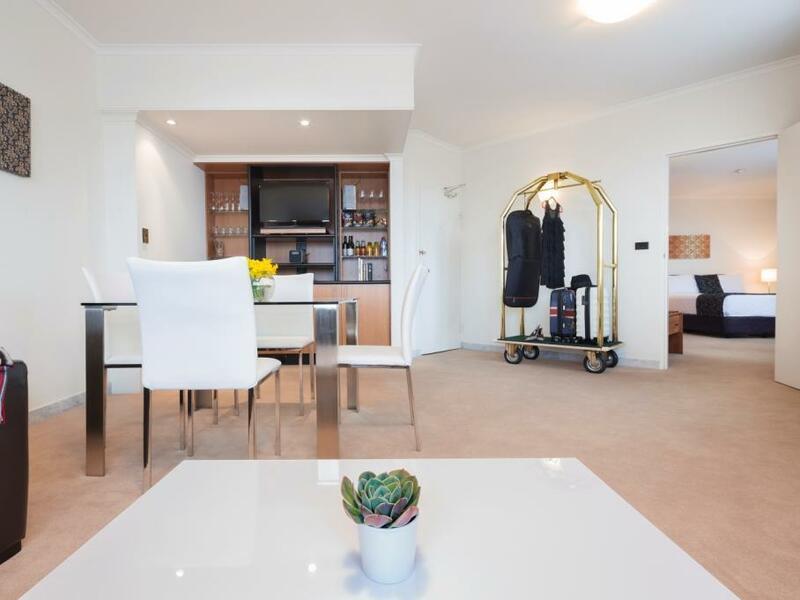 It is within walking distance to Manuka and Kingston green square for all food, pubs and supermarket. really enjoyed our stay. rooms were big and comfortable. price was excellent. staff were good, dining was very good, with very friendly staff there too. tv in rooms were far too small, and you should have a movies option too. swimming pool was small and not clean. room is clean and comfortable. carparking is convenient with direct lift access to the room level. the hotel atrium restaurant serves good food in a cosy environment. the facilities are very modest in a small space called gym. our room has a little balcony which allows some fresh air. Good big room, spa, plenty of towels and confortable bed, building with a lot of character and the kitchenette was a nice surprise! we went up for a conference and to see some of the sights, the restaurant was nice with good friendly service and check-in was quick and painless. do go for a king spa suite if you budget will stretch to it, the size and facilities in the rooms are great.